John, since you are a pious Orthodox with an interest in the arts, how do you participate in them and enjoy them and yet keep the spirit of Saint Cyril of Jerusalem's catechetical instruction? "Now the pomp of the devil is the madness of the theatres, horse-races and hunting, and all such vanity; from which the holy man praying to be delivered says unto God, 'Turn away mine eyes from beholding vanity'. Be not interested in the madness of the theatre, where you will behold the silly gestures of the players, carried on with mockeries and all indecency, and the frantic dancing of effeminate men." (On the Renunciation of Satan). Saint John Chrysostom says similar things also. An excellent question that is common, especially among converts and new readers of the Fathers. Here is my short answer, where I will not analyze the quote in detail, nor refocus on the positive elements within entertainment, but I will analyze the question behind the quote. Is entertainment vain? Yes, but at the same time most people entertain themselves in one way or another. Do I try and reconcile it or justify it? No, but I do see areas where it often does reconcile, and it is justified only on its own merits. Is all entertainment and theatre the pomp of the devil? No, but it certainly can be. Is it the way of the perfect? No, but the path towards perfection is varied within limits. Am I perfect? No. Am I pious? I try. Am I pietistic and moralistic? No. Do I want to be perfect? Yes. I'd like to end it there, but I will go a little further. 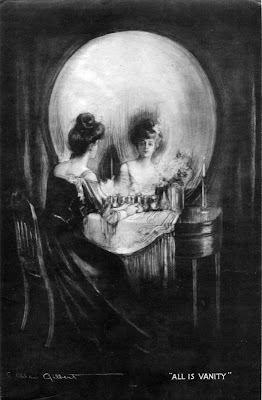 "Vanity of vanities, all is vanity" says the wise Solomon. Let's see what "all is vanity" includes. Because the important thing when considering these matters is to not just focus on those passages which only speak about other people. We need to first look at ourselves in the mirror and evaluate ourselves first. Let us consider everything else that the Fathers and Saints call vain and of the devil as well and what may apply to us. And I can support these with many passages from the writings of many Holy Men and Women that we as Orthodox honor. Every celebration of any type outside of the prayer services is vain. And this includes birthdays, anniversaries and even post-wedding and post-baptism celebrations. And forget about those Christmas presents, trees, New Year parties, or even sports events. I guess we can also throw marriage and child-bearing in there as well. Any music not sung in church, and even that must be with no instruments. Any form of entertainment that does not sanctify and is not deifying. Any unnecessary leisure and this includes beds or chairs, washing or grooming. And take off those shoes as well. Any food or drink that is made to taste good, even on those non-fasting days. Any form of transportation other than walking. Transportation can be used for missionary work or to enter a monastery, but not for vain traveling. Any education but what is necessary for survival, prayer and the maintenance of Orthodoxy. Any reading but holy books, yet even holy books are often considered vain. Any beautification, which includes shaving, haircuts, make up, hair brushing, etc. Any clothing but that which fends off the elements of our fallen world and prevents indecency and sickness. Any shelter beyond what is needed to protect us from the elements of the air. Electricity and all that comes with it is forbidden to those who completely disdain vanity. What could be more vain than speaking? Your voice exists to glorify God and perform your daily duties alone. So you can pick and choose what you want to consider vain, but if you happen to do something vain you really can't blame someone for doing something else vain. It only becomes a matter of taste then. This is why we have no right to judge or condemn unless we ourselves are sinless and not subject to vanity, which last I heard only Jesus has that sort of record and an honorable mention goes to the Theotokos. Of course, I'm not deriding any of the above things that Scripture and the Fathers call vain. They are indeed vain and they are not the way of the perfect. We have many Saints that were and are able to live such a life and forsook all, died to the world, and were able to focus on Christ in all they did, thought and said, because that was the extent to how much they loved God. Sts. Cyril and Chrysostom were among them and they had every right to rebuke the vanity they saw around them, but consider that the quote above specifically refers to pagan and pornographic entertainment in its proper context, not just any entertainment of the arts. This was the sort of entertainment that glorified evil rather than exposed it, or just aimed to tell a story or educate, as much of contemporary entertainment does (books, movies, television, etc.). Indeed we should not call good evil or evil good, and this requires a certain discernment that young converts and immature Christians usually do not have and why such issues become confusing, which is fine and understandable. To forsake vanity in all its forms should be our goal and such a goal is noble and good. But it is also progressive and should serve as a humble reminder of how truly far we are from Christ and the way of the perfect. And yes perfection is attainable and should be sought after to the best of our ability. But the spiritual life is measured and treated by the Fathers as a gradual attainment and should not be moralistic in nature, but rather a natural progression of the spiritual life as long as it does not drive us towards sin. Our love for God is like a flame, the more it burns the more vanities are consumed. For some people entertainment only leads them towards sin, and they may have to evaluate what they consider entertaining and why it is indeed sinful for them. The Fathers and Saints themselves would have confessed that they also did vain things once in a while, and by this I mean something like putting a piece of lemon in their water to make it taste better (yes, this is vain!). Perfection and the abandonment of everything vain takes years for most people and the longer it takes the more it shows how sinful we truly are and attached to this vain world in which all will perish and pass away. May we all be worthy of such a life like that of the angels.